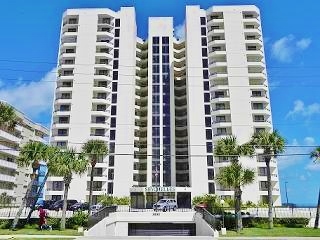 Seychelles condo is one of the most sought after condo buildings in the Daytona Beach Shores area. 2 and 3 bedroom floor plans. This building is meticulously maintained and located on a "no drive" beach! Seychelles condo offers residents many superior amenities. Feel secure with key card access all doors and cameras at all entrances. This 17 floor, 98 unit complex allows 2 pets up to 20 lbs and a 2 week minimum rental policy to capitalize on rental income.